If you snooze, you lose…goes the saying! 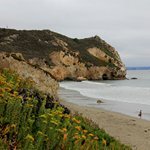 Indeed, if you’re driving on the 101 freeway around the Pismo Beach area and you miss the Avila Beach Drive exit, then you lose a hidden jewel on the California Central Coast. But if you’re willing to get off the beaten path and get off the freeway you will be rewarded greatly with stunning views of the ocean and a relaxed atmosphere in one of the little known California spots. Port San Luis, California is the perfect hidden jewel of the Central California Coast. It’s small, clean and simply beautiful! Port San Luis, along with Avila Beach are those places that if you don’t know about them you will pass right by without noticing them. Port San Luis is a stunningly beautiful place but it’s well hidden from the freeway that passes just ten minutes east of it. Drive on the pier and park at the end of the pier right next to Old Porte Inn. Take time to see the many sea lions that love resting at the bottom of the pier. There are also lots of them swimming around the pier. So just take some time to observe them, they are very playful and vocal. Walk to the end of the pier and enjoy the views. Drive to Avila Beach for a visit. Read my travel guide for Avila Beach, California. Enjoy the stunning views of the San Luis Obispo bay from the Port San Luis pier. Any great beach town must have a long pier. Port San Luis is no exception. In addition the Port San Luis pier has some very special features. For one, you can drive on the pier at no cost and park very close to the end of the pier. This is an added bonus especially if you have children, as children tend to complain a lot about any amount of walking. So, take advantage about this feature and drive on the pier all the way at the end. Once there, you will notice the strong fish smell, as Port San Luis is full of fishing boats and they have an actual fresh fish market on the pier. We loved just walking around on both sides of the pier and admiring the views. On a clear day you can see all the way to Pismo Beach and the views all around are splendid. Port San Luis, California – Beautiful view of fishing boats seen from the end of the Harbor Pier in beautiful Port San Luis Harbor. Enjoy the marine life at Port San Luis Harbor pier. In addition to being able to drive on it for free, the Port San Luis pier has one extra unique feature which makes the Port San Luis pier very special. Towards the end of the pier there is a specially constructed resting place for sea lions at the bottom of the pier just above the water level. Sea lions love this place because they can just sit in the sun and do nothing. So, there are loads of them. Your kids will love looking at them and listening to them because they are quite loud. Port San Luis, California – Sea lions basking in the sun on the specially constructed deck at Port San Luis pier. In addition to the sea lions resting below the pier, there are many other sea lions just swimming around the pier. If you take the time to just way and watch the scenery and the water you will undoubtedly see quite a few sea lions swimming around and playing in the area. The easiest way to get to Port San Luis Harbor, is on the 101 Freeway. As you pass Pismo Beach, look for the exit indicating Avila Beach Drive. Then follow Avila Beach Drive all the way as it winds its way down through the mountains to Avila Beach at the ocean. This is one very scenic drive and you should drive slowly in order to enjoy it. If you are in the Pismo Beach area already, just follow the road through Shell Beach leading to Avila Beach Drive. This road is just beautiful, with lots of spots on the edge of the ocean where you can enjoy amazing views of the ocean and marine life. Once you reach Avila Beach, continue on the road, all the way to the end, then you can drive on the pier or just park there and walk around. Map of Port San Luis, California and surrounding area. Is it worth spending time at Port San Luis Harbor? Port San Luis, along with Avila Beach will make the perfect trip especially on a sunny day. The abundant marine life around the Port San Luis pier makes it a very interesting spot for children who will enjoy it very much. 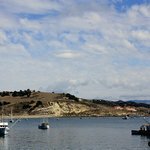 In addition to the small beach nearby and the beautiful Avila Beach just a few minutes away, Port San Luis is a true California destination for those of you who love the ocean and the beach.